As soon as I walked into The Blues Kitchen I knew I was in for something special. The 1950’s style vibe and decor inspired by the Deep South hits you immediately as you hear the deep soulful music, gaze up at the incredible lighting upcycled from gramophones and admire the murals of iconic Blues players adorning the walls from Blind Willie to Jonie Cobb. The huge bar fits the theme perfectly too and also boasts the largest collection of whiskies in London. We took our seats in one of the many deep luxury booths and checked out the menu of hearty Texan BBQ fair. The menu was a pleasant size but there is something for everyone including Southern classics with exciting twists such as Creole Bean Burger, Charred Corn & Blackbean Gumbo, and Chargrilled Shrimp Gumbo. Of course, a BBQ joint wouldn’t be complete without American favourites like Buffalo Wings, Cajun Fried Chicken, and Brisket & Burnt Ends which are of course included here. Our delightful server helped us decide on our starters - Buffalo Wings with Blue Cheese Dip, Cajun Popcorn Squid with Burnt Lime & Sriracha Mayo, and Hot Spinach Dip with Blue Corn Tortilla Chips. As expected, the giant crispy wings smothered in American hot sauce were juicy and succulent and of course tasted great when dipped into the creamy blue cheese dip. The Cajun squid were crunchy and full of flavour and were perfectly complemented with the sriracha mayo and burnt lime. However, the star of the show was the hot spinach dip made with blended baby spinach, artichokes, parmesan and topped with plenty of gooey cheddar cheese. The dip was creamy smooth and decadent and it was a delight with the freshly made crunchy tortilla chips. To help wash down our starters we chose a couple of cocktails from the huge drinks selection. I decided on the Lychee Martini made with fresh lychee and lychee liqueur, whilst my guest went for a classic Old Fashioned. Both cocktails tasted great and really put us in the mood for what was to come next. For mains, I knew exactly what I was going for - the Korean Fried Chicken Sandwich topped with mozzarella, crunchy kimchi, miso ‘slaw, kewpie mayo and sprinkled with black sesame. 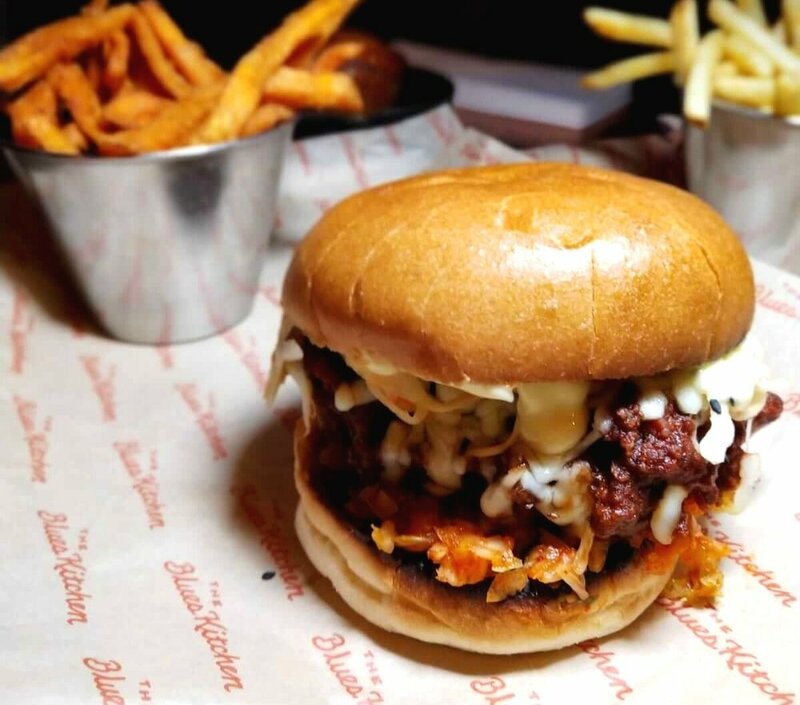 The sandwich, essentially a burger, had a great combination of Asian and Western flavours and the lashings of miso ‘slaw and kewpie mayo really complemented the flavours of the BBQ chicken. My guest opted for the Burger of the Month, the Surf and Turf, complete with a side of fries and coleslaw. 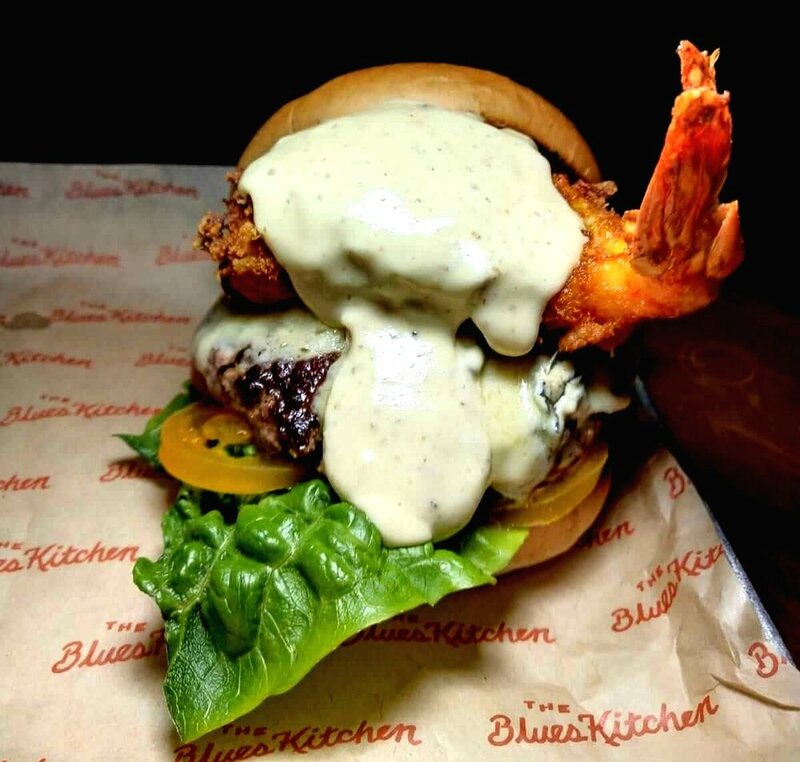 The burger itself looked like a ‘Man vs Food’ challenge with a giant breaded jumbo prawn sticking out of the top of the burger covered in cambozola cheese and bone marrow aioli. Although mammoth, the burger was very tasty and the ribeye patty was both juicy and flavoursome. With our mains, our next cocktails were the Spiced and Stormy and the Strawberry Bramble. The latter was nice enough but the real deal was the Spiced and Stormy, which was made with Gosling’s Black Seal - lime - pineapple - Angostura bitters. If, like me, you love rum based cocktails that aren’t too sweet or overpowering, this is the perfect cocktail for you and I’d definitely recommend you give it a try. To bring our evening at The Blues Kitchen to a close, we tried the highly recommended Oreo Donuts which is exactly what it sounds like, oreos covered in donut batter and deep fried to crispy golden perfection. These are a must and the accompanied hot salted caramel sauce for dipping makes it all the more naughty and decadent. We also tried the Cornflake Sundae which we were quite intrigued by as it consisted of cornflake ice cream topped with cornflakes and butterscotch sauce. I found it quite misleading as it wasn’t a Sundae in the traditional sense, however the ice cream was delicious and it really was like eating cornflakes and milk but for dessert! The prices are what you expect for a BBQ and burger joint with burgers around the £12 and main dishes averaging around £15-18. You also get a decent portion size so you won’t feel short-changed when your food arrives. There are also various sharing platters which may be a better option if with a big group of hungry diners. We had an absolutely fantastic time at The Blues Kitchen and really enjoyed the decor and vibe of the place as well as the tasty food. This is definitely a place to try if you love your American comfort food or even for a few cocktails in a chilled out and mellow place. Special thanks to Blues Street Kitchen for their hospitality!